Founded by Thomas F. Hilburn in 1979, Laser started as a tool and die machine shop that quickly grew to a full scale manufacturing operation with over 25 employees - concentrating on design, build and testing of machined molds for plastic injection, thermoplastic and rubber products both cold and hot runner. In the mid 80's continuous research and development led us to introduce the Laser Drill. This precision hole boring system eliminated precious man-hours out of the cost of our tooling. Made from the finest heat-treated steel, the drill body's rigid insert nest and straight flutes promote long insert life and facilitates efficient chip removal. In the early 90's the decision was made to diversify from automotive and connector type molds to include small appliance, custom packaging and telecommunications tooling. From that technology we introduced the Laser Modular Molding System. Each frame can be retrofitted with a thicker cavity plate, slide plates, or expanding cavity inserts to form threads. Plate interchangeability is maintained through out the line. The Modular Molding System is excellent for ramping up to production, prototyping, or short plastic runs. 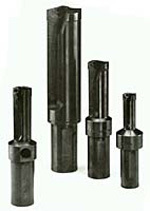 Laser Plastics, formed in 1993, added injection presses to our facilities list to expedite tool sampling and R & D. Seven different press sizes with various shot capabilities helped advance molding techniques. In the mid 90's we introduced the Laser Hot Manifold. Available with wear resistant probe tips, built to your specifications in four weeks or less. These manifolds have been on production floors running high-engineered plastics while reducing cycle time, color changes, and down time. Along with this advanced manifold we developed the Laser Hot Sprue and Miniature Hot Sprue - designed for interchangeability with the components used in the hot manifold, available with a multi-tip to expand a cold runner to resemble a hot runner and make molding low cavity efficient. In the late 90's, Laser Plastics outgrew the Research and Development building and ground was broken to construct a dedicated pressroom and warehouse. Completed in 2001, this complete molding facility can take your project from conception to part engineering and mold design, tool building and qualifying as well as molding, inspection, sub assemblies and packaging. Laser Tool & Plastics will continue to deliver quality plastic products to our customers. As always, continuous effort will be applied to improvement of manufacturing efficiency, at our facility as well as yours.